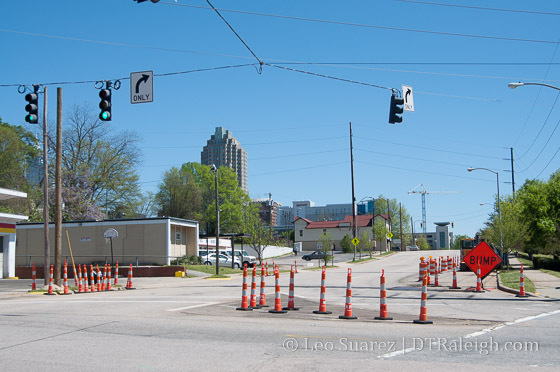 The two-way conversion of South and Lenoir Streets have begun. You could loosely call this a phase 2 project as parts of Lenoir and South were converted to two-way years ago when the Raleigh Convention Center opened. Now, the city is finishing the conversion so that the streets operate as two-way from end-to-end. 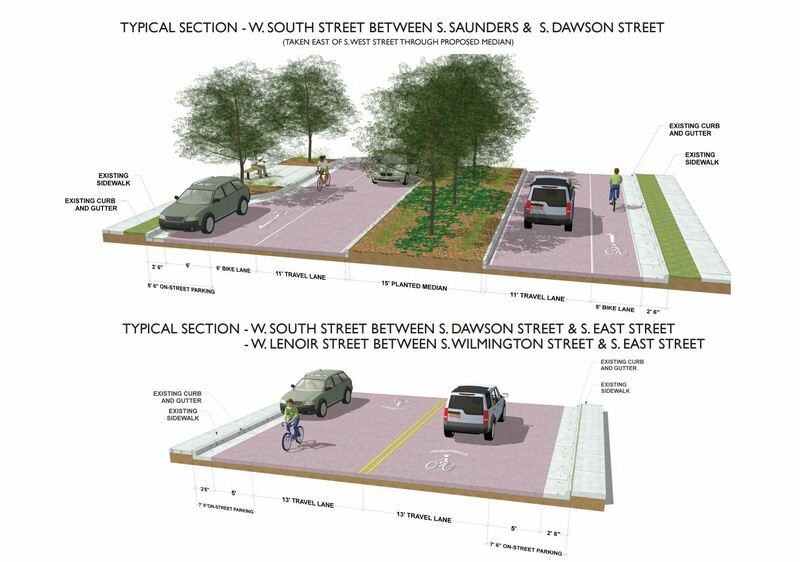 For all the details, jump over to the Lenoir & South Street Two-Way Conversion project page on the city’s website. Going west to east, South Street is two-way in Boylan Heights but flips to one-way (east bound) at South Saunders. Shown in the photo above, utility work is taking place and throughout the year the street in this area will contain bike lanes, landscaped medians, and travel lanes going in both directions (of course) up to Dawson. At Dawson is where South flips back to two-way. Along South through downtown, the street flips back to one-way (east bound) at Wilmington Street. There will be one travel lane in each direction from here all the way to East Street. The traffic light at Bloodworth Street will be removed and replaced with a four-way stop. Lenoir Street looks less complicated. No conversion work is needed on the west side of downtown and the work begins at Wilmington Street. The east bound one-way street between Wilmington and East will be converted to one-lane in each direction. The traffic lights at both East and Bloodworth will be replaced with four-way stops. As someone who travels in this area by car and bicycle, this conversion is very much welcomed. It’ll also be a nice alternative when Fayetteville Street is completely closed during event season. This is wonderful news! Can’t wait to see this conversion take place to slow down these streets a bit, and make them more navigable by bike and foot. I thought Jones st was supposed to go 2 ways at some point? Is that still happening? This can be a real game changer. I sure hope we see a lot of planted medians! I just realized that I could click on the typical street sections and read the fine print. I am very happy that the car lanes on the west side of South are going to be 11 ft lanes instead of 12 or 13. Between the lane width and the median, the traffic should be slower through the corridor. Of course, the bike lane makes the overall lane appear wider but that could be manipulated by painting the bike lane green. I have mixed emotions about the sharrows for the east side of the road. While they are arguably better than nothing, my experience on a bike is that drivers get annoyed if you even attempt to ride nearer the middle of the road. They want you you stay snug to lane of parked cars. Of course, this creates another level of issues for the cyclist. Infrastructure projects like this one should focus on doing everything that they can to unify the east and west sides of downtown. The huge differences between these two sections don’t give me confidence that its a unifying design. In addition to the protected bike lane and the median, the west side also has a planted parking strip next to its sidewalk while the east side does not. I bike this area a ton too. I’m also glad to see the west South St configuration….the legacy configuration that was meant to whisk Lake Wheeler commuters through the “bad” part of town as fast as possible really grinded my gears…sometimes literally around there in an effort at self preservation. It looks like the Lenoir part is mislabeled as “W” since all that is denoted is east of Fayetteville. The sharrow portion of South actually is east and west of Fayetteville so isn’t truly “W” either, but I’m being a nitpick. South Street traffic is normally very light, so I think I am happy with the two-way, however it’s set up for bikes. If the stretch from Dawson to Salisbury ever gets buildings along it again, perhaps marked bike lanes will be needed then (as an aside, South was a very cool neighborhood street up into the 1960’s…). There was also just released a rendering of some modern townhouses on the Ice House site and the adjacent car yard, so all the area is rapidly changing in form. I travel Lake Wheeler to Saunders to South to get to work. Getting home is a bit tricky and I’m kinda forced to the one-way S Saunders (between Cabarrus and Lenoir). Wish I didn’t have to go this way but it avoids a couple of long lights. I’d rather take a right on South street then a then a left of S Saunders. Thanks for the update. Mark, Do you have a link to those South St. Townhomes? I live near there and would love to see them. I also bike South St to downtown daily and am excited about this project. Hopefully it will help the retail around Boulted Bread. Soon I’ll be able to take bike share on a bike lane to Boulted Bread. My little city is growing up! Bruce, the image can be seen on the Raleigh Architecture instagram feed. Its short on details but the Ice House site can be gleaned from a couple of things in the image. The site is owned by Lambert Development and if you go to their website they have posted a site plan for the SW corner of West and Lenoir for 12 townhomes. So you’ve got to two projects cooking over there which I think look pretty good and compliment everything else going on. @Mark, I couldn’t find the images you say are there on instagram. What is the exact name of the instagram account please? Thanks! John, it’s @the_raleigh_architecture_co but looks like they deleted it. The description was vague so maybe they didn’t want to announce it yet since people caught on. I was blown away when I saw it.